Valentina Riches : Falling in Love with Fall- Sale you don't want to miss! Falling in Love with Fall- Sale you don't want to miss! Fall officially started last Friday and I'm loving it (even though my first day was spent with a nasty stomach virus). Here in Utah the days reach a high of mid 50's and low 40's a night, which means its time to start taking out those cardigans, long sleeve tee's, boots, and of course those pretty fall dresses that have been waiting in your closet for you to wear! I'm a huge fall/winter lover. I mean the summer is great and all but I rather be nice and toasty then sweaty haha. Recently I went shopping at my newest boutique discovery, My Sister's Closet and fell head over heals at their entire shop! Their shop is filled with all the fall colors you could ever think of! From beautiful navy, maroon, mustard colors, to soft pinks and whites! I'm trying to shop for colors I don't have or have much of in my closet and so I was determined to find the perfect items! I even brought my mother in law with me and little mason to help me choose. You guys I walked away with the cutest items! They are breathable, stylish and oh so comfy that I am excited to share with you all how I styled them! Also keep reading to the bottom of this post to see details on an amazing sale with My Sister's Closet Boutique that you don't want to miss out on! 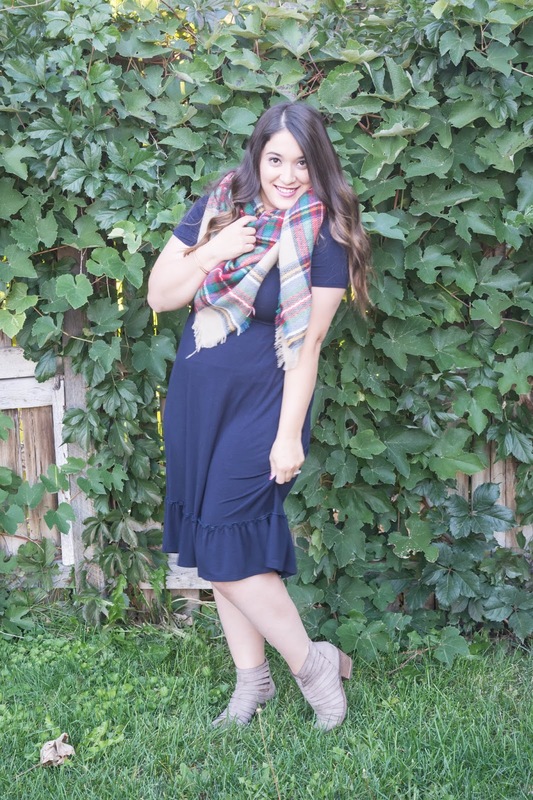 I love pairing my Eliza Hem Dress in Navy with my over sized blanket scarf and ankle boots. Guys this outfit is beyond perfect for fall. This dress is very comfy and with the over sized blanket, I just feel like I can be cozy all day! 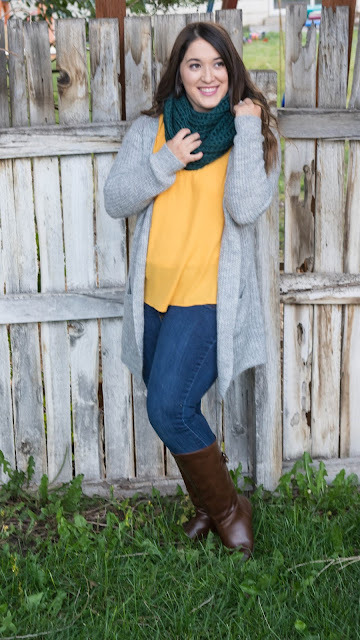 I have paired my Kinlee knit cardigan in heather grey with my newest favorite fall color; mustard top! I even added more color to it and added a dark green infinity scarf to it! I am loving all the color in this outfit, maybe it's too much but I absolutely love it! I also of course had to finish this look with some blue jeans and a pair of high boots! This is probably my go to outfit in the fall; boots, jeans, and a cardigan. Simply love it! 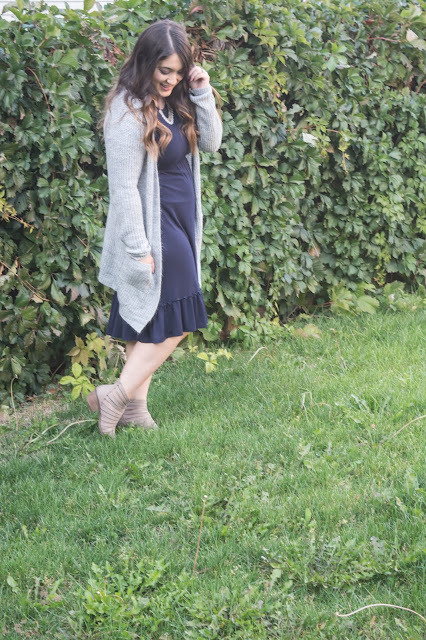 I decided to have wear my Eliza Hem Dress and my Kinlee Knit caridgan together because I loved the look of it and how well the colors of each piece matched together so perfectly. I've seen this style before where someone pairs a dress and a long caridgan and now I see why it's so cute, I'm going to do more of this with my cardigans and dresses! I also wore my ankle boots and added a few bracelets to help accessorize the look. The coziest of cozy! Sometimes I don't have time to get ready or simple don't feel like it #momlife #toddlerlife haha. 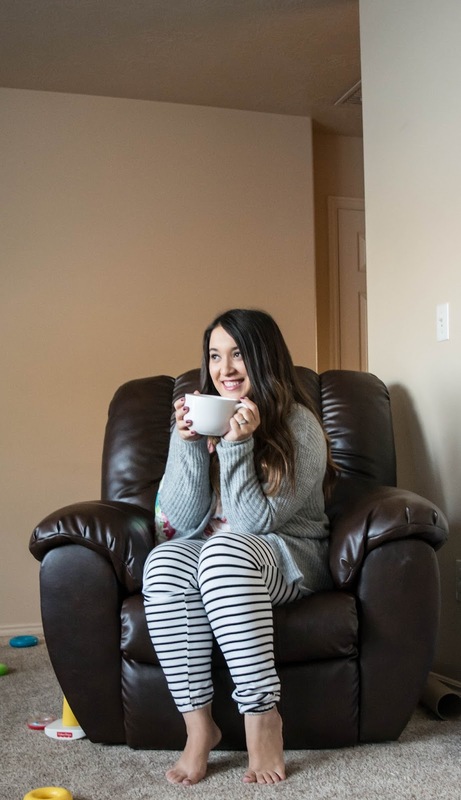 So on those cloudy stay at home days, I just wear a pair of loungers or sweats, a baggy shirt and my Kinlee Knit Cardigan. To me this outfit says my outfit is cute and I'm wearing day old make up but the day is still good and I will accomplish what needs to be done lol. Now for the moment you've all been waiting for, My Sister's Closet Boutique is having a GNO (Girl's Night Out) this Saturday 9/30! They will have refreshments, giveaways every 20 minutes, AND a sale on ALL NEW ITEMS!! So bring your girl friends, step away from the stress, and have a great time with them! !